Eliphaz was the first of Job’s comforters to speak, and his line of reasoning is simple. 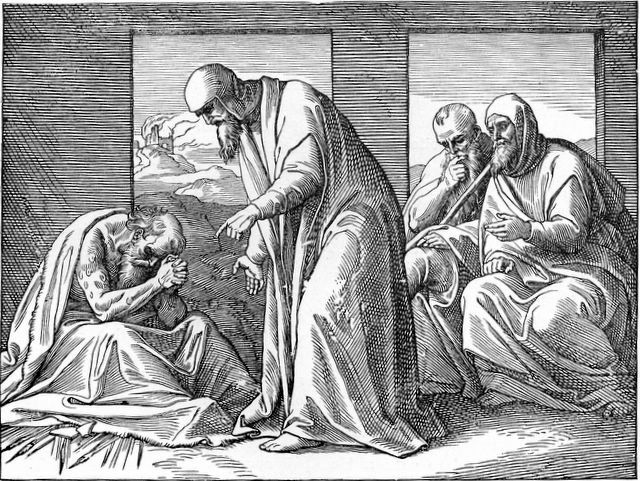 Over the course of the following discourses, it will be repeated again and again by all three of Job’s friends: Nobody just “suffers” – for no reason; If you do good, you’ll prosper; If you don’t you’ll suffer; You’re suffering; Bottom line – you must have brought this on yourself through your sin. Their collective theology is not uncommon today either. We all want to be able to answer the question “why?” when we suffer. But what makes it so difficult to work through is that there is a germ of truth in their thinking. It is true that sometimes we DO suffer because we’ve brought it directly upon ourselves. Bad choices, sinful attitudes, thoughts and actions each have their natural consequences. And yes, God does use certain events in the lives of people as a specific means of chastisement at times. But this is not always the case by any means. And in our rush to answer the “why?” question, we can create such a flattened out theology that we leave no room for plans, purposes and actions of God that might not be as easily discernable as the formula: Sin and you’ll suffer, do good and you’ll prosper. But we are often unwilling to do that. Whether it is out of our own uncomfortability with their pain or fear that maybe we could suffer without a discernable cause too, or whatever else – let us be like doctors who are not interested in increasing the pain of a patient with a broken leg because they broke it doing something stupid – and rather seek first to ease the pain and THEN treat the other attending issues. 6:2-7 / Listen, Eliphaz, talk is cheap. You have no idea how deeply I’m suffering right now. And you give me glib answers? I’m in pain here! 6:8-13 / I’m already at the point where I wish God would just kill me and get it over with. 6:14-23 / Don’t you fear God – to give me vapid and cheap advice when I’m grieved beyond all measure and wrestling with the largest issues of life and death? Your words are useless to me right now. 6:24-27 / If you’ve got something substantive to say – I’ll listen. But don’t treat this like a game. 6:28-30 / Man to man, tell me exactly what sin you think I’ve committed to bring this on. Show me! 7:1-6 / Have a little sympathy man! Life is hard anyway. Right now, it is interminably painful. 7:7-10 / There’s no recovery from what I’m going through. 7:11-21 / Since this is so dire – I’ll just spill my guts completely. I’ve got nothing to lose. You’re treatment of me right now is inhuman. Do you really think I’ve done something to warrant this, and that I can just repent and it will all be OK? Is that what you see in your “visions”? Spare me.